Iran Arrests Opposition Leaders, According To Reports : The Two-Way Iran has arrested two former presidential challengers who helped to spark demonstrations against President Mahmoud Ahmadinejad after losing a disputed election in 2009, according to reports. 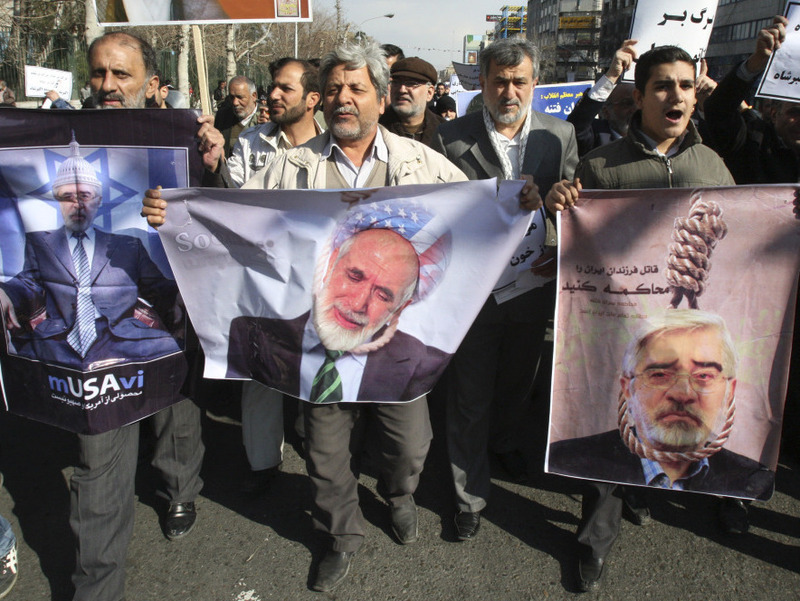 Pro-government Iranian demonstrators carry mocking photos of opposition leaders Mir Hossein Mousavi (left and right) and Mahdi Karroubi during a rally after Friday prayers in Tehran, Friday, Feb. 18. Iran has arrested two former presidential challengers who helped to spark demonstrations against President Mahmoud Ahmadinejad after losing a disputed election in 2009, according to reports. Since that election, and the protests that followed, Mirhossein Mousavi and Mehdi Karoubi became opposition leaders. In light of protests and unrest in the Middle East, Iranian authorities placed them under house arrest more than two weeks ago. Citing an opposition website in Iran, Reuters reports that Mousavi and Karoubi "have been arrested and transferred to Heshmatiyeh jail in Tehran." As reported by The Washington Post, Iran faces a dilemma over how to control the two opposition figures without inflaming popular support for their cause. An opposition website says that the two leaders were taken from their homes late last week. The Post quotes Iran's chief prosecutor as saying that the pair "were placed under 'restrictive circumstances' and not allowed to receive visitors or make phone calls." The AP reports that the official, Gholam Hossein Mohseni Ejehi, said that isolating Mousavi and Karroubi is the "first step." In a news release from Iran's official news agency, Ejehi said, "Should circumstances arise, other measures will be taken."